I have access to a CcMmYyKk inkjet printer at work and it seems to my eye that results are smoother (which makes sense since there would be less halftoning going on), but also that we are able to reproduce a bit wider gamut than a regular CMYK inkjet. Blues and violets seem particularly more vivid. Is there really a difference in gamut or is it an illusion due to some other variable? I haven't found an example for a CcYyMmKk in the standard gamut charts found online. Well, every printers gamut differs form other printers. 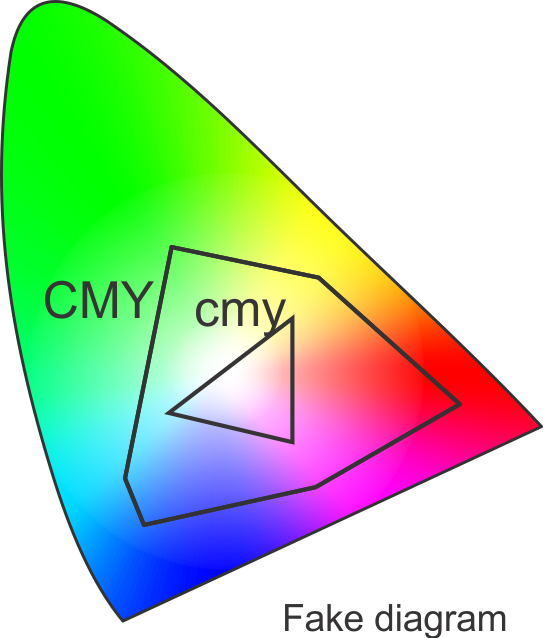 But if you're asking whether CcMmYyKk offers gamut improvements over CMYK using the same inks and device, then the answer is a that it potentially gives you slightly more ranges at lighter colors one would need to measure. But really this depends heavily on the actual implementation details of each ink. It does however make for a more compact raster screen or maybe more accurately, stochastic screen, so in a way the printer produces sharper images despite having the same dot pitch as a comparable CMYK printer and this can make the images also appear more vivid. The lighter inks are used for one reason. It is more likely to perceive a color dot on a light surrounding, than a lighter dot. I am trying to simulate a K print on the left and a Kk on the right. On the zoomed area you can see that your eye perceives a lot more the dark dots. Open the image on a new window and view it at 100%. And here is a rough fake diagram on where the light colors stand. They are not there to expand the color space, they are inside the already defined color space. Not the answer you're looking for? Browse other questions tagged cmyk print-production color-reproduction gamut or ask your own question. Simplest set of inks that could print the RGB gamut? Large format printer that will print on 1/8th inch material?